﻿﻿﻿﻿﻿﻿It is not enough to be industrious; so are the ants. To enhance school infrastructure, provide educational materials and resources to children in the rural community of Bumthang, Bhutan. The Zangtherpo Community Primary School is located in the Chokhor Valley in the rural district (Dzongkhag) of Bumthang of Bhutan. It serves approximately 150 students from pre-kindergarten through sixth grade fairly evenly divided by gender. Curriculum is taught in English with the exception of instruction in the native language, Dzongkha. Classroom sizes range between 20 to 30 students and subjects are taught in clusters: math, science, social studies, and language arts — similar to primary curriculum in the United States. Administratively, the school is managed by the Bumthang Dzongkhag Education Office in consultation with Bhutan’s Ministry of Education. Teachers are local residents who have undergone training, and most possess teaching credentials. Since this is a community school, all students reside in the surrounding area and many of their families are multigenerational to the area. Primary and secondary education is free in Bhutan, and the government has established some 7,932 schools across the country to provide education to even the most remote communities. However, the quality of education varies greatly depending on where these schools are located. 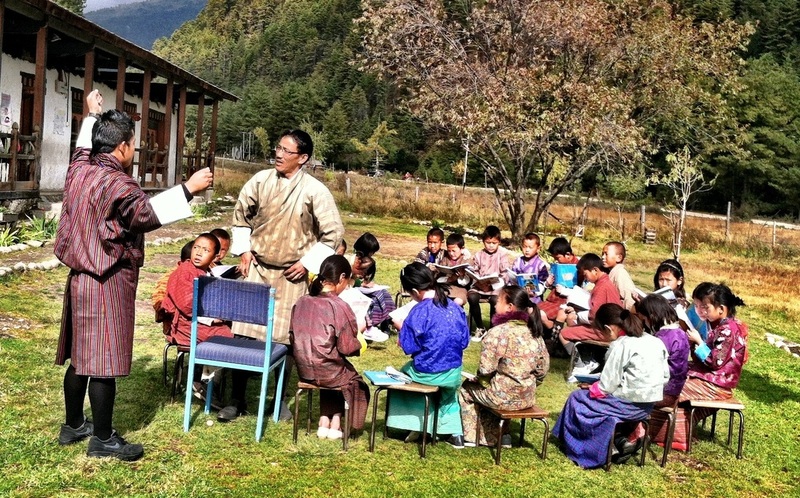 Schools in the more remote areas of Bhutan (i.e. Trongsa, Zhemgang, etc.) suffer various disadvantages compared to those in the urban areas (i.e. Thimphu, Paro, etc.). Climatic conditions (cold weather and snow) don’t have the impact here that is experienced in the severely remote mountain passes on trails leading to communities like Lingzhi and Lunana which are snowbound for much of the year. However, teaching and learning are impacted by the lack of heat and electricity in the classrooms of Zangtherpo Community Primary School. While the absence of these infrastructure commodities does not severely impact the learning environment, it challenges their ability to use many effective resources to support a more comprehensive learning environment. This is particularly true because resources such as library books, lab and reference materials, teaching aids, lesson plans, and supporting curricular materials are absent. This project consists of two parts: first, minor structural improvement to the Zangtherpo Community Primary School and second, provisions for school supplies and teaching equipment. The Zangtherpo Community Primary School consists of three multi-classroom buildings. One houses pre-kindergarten and kindergarten, a second houses fifth and sixth grade and a small administrative set of rooms, and the third consists of classrooms for second, third, and fourth grades. While multi-grade teaching does occur (where all children work at their level but in the same room), most learning is accomplished in single grade formats. Teachers of different subject matter move from room to room based upon the weekly curricular plan. The school currently has an internet connection but has no computer equipment to connect to the internet. In addition, there is a work space which is currently used by the teachers and administrative staff to collaborate and manage administrative needs. The space is inefficiently designed and with minor structural changes and improvements could be turned into a small teacher/student resource center. The resource center would include one or two computers with internet access and accessible storage for classroom books, teaching materials, reference books, and classroom handouts. These materials are not solely for “enhancement” but are needed to support general instruction and mandated curriculum. In discussions with the principal and teachers at the school during our visit, all were more than willing to give up what little space they have in order to better serve the overall learning and teaching environment. Teachers expressed that the lack of teaching resources (teacher materials, reference materials such as grammar books, encyclopedias) hindered their ability to deliver the best learning environment. The dearth of supporting curricular materials for the classroom rendered the overall situation difficult to challenge students who require differential education. The only classroom material available to students is the textbook provided by the Ministry of Education. Supplementary materials to explain and explore a topic in depth are non-existent. There are no additional textbooks to assist with visual or auditory learning, and little material to offer those with special needs – a topic of recent national discussion. Mindspring Foundation will be working with the school staff and local district officials through a local Mindspring Foundation representative. After an initial assessment and approval from appropriate authorities, structural work will be coordinated with the school administration and appropriate government level oversight. Project updates will be submitted at three month intervals with a final work report upon completion of the project term. Mindspring Foundation believes that in order to generate sustainable, long-term commitment to education, these structural improvements combined with an enhanced education program will have a wider community impact and lay the foundation for greater community involvement within and at the school.